Following the success of the first edition, the updated and revised DC Comics Encyclopedia offers even more incredible DC detail and imagery than original. 48 brand-new pages include major updates on characters and storylines (including the recent "Infinite Crisis" story arc). 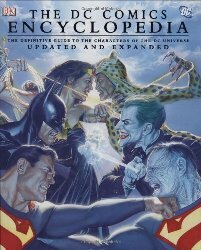 This spectacular, up-to-the-minute encyclopedia will delight comic fans of every age. Open to legal residents of the United States 18 years of age or older. Only one entry per person, e-mail address or household.